Softball and baseball are typically identical in many aspects but there are also major aspects that the two sports differ in. Ideally, softball borrows a lot from baseball especially in terms of how the sports are played. Most observers watching the two sports simultaneously may actually find it hard to point out the differences in these sports. Overall, the difference between softball and baseball isn’t that great as the key/fundamental essentials of either of the sport are similar to those of the other sport. Softball is majorly played by females and children while baseball is commonly played by males. 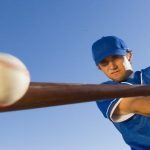 Read my article “What Are The Differences Between Softball And Baseball?” below for more information. In baseball, particularly at higher playing levels like in college leagues, there is a pitching mound where the pitcher throws the ball from. In softball, both at the lower and advanced levels there is no pitching mound. Pitchers in the softball throw the ball on the same level (ground) with the batter. Additionally, in baseball, the pitcher delivers the ball in an overhand or sidearm motion depending on their preference while in softball; the pitcher delivers the ball in only an underhand motion. The pitching distance in baseball is different from that in softball. In baseball, this distance is roughly 18.44M (60ft6”) while the pitching distance in softball varies by level. For women’s amateur level, the distance is 12.19M (40 feet), 13.11M (43 feet) at high school level, and 14.02M (46 feet) at college & international leagues. The sloping mound in the pitching area in baseball area has a radius of 2.7M (9 feet) and has a maximum height of 25cm (10”). In softball, the flat circle in the pitching area has a 2.4M/8 feet radius. In softball, the base paths are shorter than the paths in baseball by a few feet. When pitchers throw balls from a distance of 35 feet, the bases are at approximately 55 feet apart and while at 40 feet, the bases are at 60 feet apart. Since the base paths in softball are smaller, the infield area is also smaller than that in a baseball pitch. This affects the infielders’ defense. There is a great variance between the outfield measurements in baseball and those in softball. The distance between the home plate and the outfield fence is 150 feet in softball for lower leagues and 225-250 feet for the upper leagues. The distance between the outfield fence and home plate in baseball is usually 300+ feet particularly for major leagues. However, despite these differences in distance, it is worth noting that both the fields for softball and baseball are laid out in the same way. 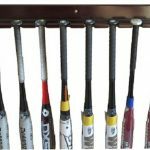 Bats used in baseball and softball differ in terms of length and barrel size. The bats used in baseball measure a maximum of 42 inches in length, although most bats except those used in international leagues measure 34 inches. These bats have a large sweet spot with a diameter of 2.75” and a 2 5/8 barrel size. The maximum drop for these bats is -3. On the other hand, bats used in softball measure a maximum of 34 inches in length with lower leagues using bats of a shorter length. These bats have a maximum drop of 12 inches and are slender than baseball bats. The maximum diameter in these bats is 2.25”. 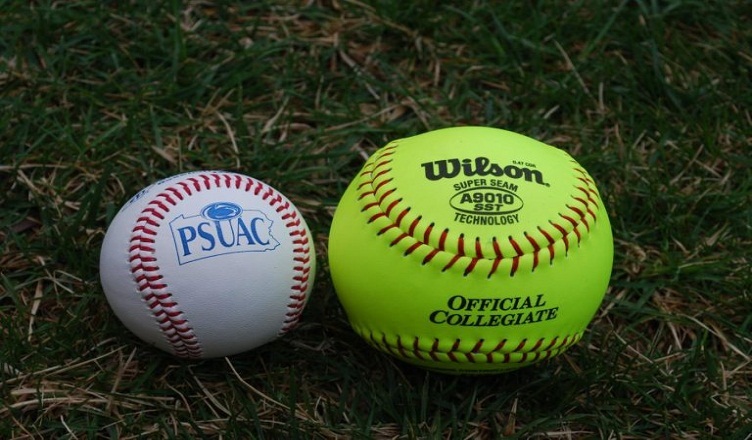 Balls used in baseball are smaller in size than those used in softball. 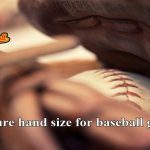 Balls used for playing baseball have a circumference of 9 inches (229mm) while those used for softball have an 11-12 inches circumference and are less dense than baseball balls. A softball weighs approximately 6.25-7.0 ounces while a baseball weighs about 5.0 ounces. A full baseball game has 9 innings (6 in little league and 7 in high school leagues). On the other hand, a full softball game has 7 innings with the number of innings in college leagues being 5. The two sports differ in how ties are broken. In baseball, a tie only comes about if both teams have the same score at the end of the 9th inning. When such is the case, the game proceeds to additional rounds until the tie is broken. In softball, the concept of breaking the tie is the same only that in this sport, there is an extra aspect that is non-existent in baseball. This is whereby if the tie is not broken by the end of the 8th inning, the offensive team starts its turn at the bat when the player scheduled to bat at the ninth attempt placed at the second base. This player (often a runner) can be substituted through the provided substituting rules and each additional inning beginning with the runner being at the second base until the tie is broken. There are great differences in this area like just in other areas of the sports. In baseball, a player (runner) can lead off/ attempt to steal at any time provided that the ball is in motion/live. However, in softball, a runner can only lead off after the ball has been released by the pitcher. Running at other times amounts to a fault and the opposing team scores a point. Baseball is taken more professionally as a career option as compared to softball. Typically, playing baseball professionally is by far well paying than playing softball. Career baseball players playing in a major league earn an average of $3.3-$4 million per season. Softball players playing the sport professionally are paid about 2,000-5,000 dollars every season. This disparity in the salaries of these sports is mainly accounted for by the fact that baseball has a lot more fans than softball. Coaches of softball earn a considerable amount of money at an average of 100,000 dollars every year depending on the teams they are coaching. Ultimately, baseball and softball are quite similar even though there exists obvious differences between the two sports in addition to gender differences. 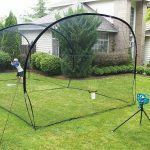 The popularity of softball has been growing steadily over the past few years and the sport is now being played in several places all over the world. Despite these differences, both sports are fun and thrilling to play. What Is The Best Way To Clean White Baseball Pants?